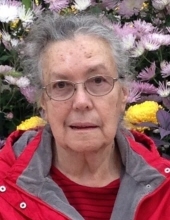 Marilyn B Watson (nee Perkins) peacefully on February 3rd 2019 in 80th year. Loving wife of Morley (Feb 2017) for 56 years. Will be deeply missed by her children Benjamin and Maxine and her neice Erlene. Grandma to Brandon, Sawyer, Alora, Lynona, Hannah, Peyton and Eli. Great grandmother of Symon. Marilyn was born in Cowansville PQ to the late Earl and Irene Perkins. Predeceased by her dear sisters Mabel and Nancy. She will be remembered by many neices, nephews and cousins. A sweet soul who spent her life serving the Lord while caring for others as an RPN. "Email Address" would like to share the life celebration of Marilyn Watson. Click on the "link" to go to share a favorite memory or leave a condolence message for the family.